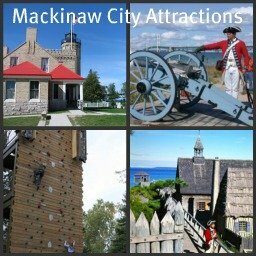 The correct spelling of Mackinac City Michigan is Mackinaw with a "w" at the end rather than a "c." But no matter how you spell Mackinaw City it's still one of the most popular northern Michigan vacation spots in all of Michigan. First of all it is the Gateway to magical Mackinac Island, Michigan which is spelled with a "c" at the end rather than a "w". Confusing isn't it? Do you want to guess if the Bridge is with a "c" or a "w" at the end? Don't forget the bridge starts at Mackinaw City? Well, the correct spelling for Big Mac is with a "c". So, Mackinac Bridge is the correct spelling even though it is in Mackinaw City and ends in St. Ignace in the Upper Peninsula. it's a great choice as a vacation "Base Camp". 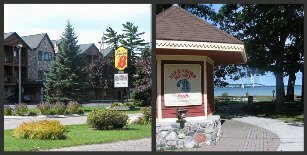 With its varied attractions such as the Old Mackinac Point Lighthouse, the great camping at Mackinaw Mill Creek, or all the other fun things to do in Mackinaw City you won't be disappointed when choosing one of the wonderful Mackinac City Michigan hotels. Insider Tip: When making Mackinaw City your base camp be sure you head west to visit beautiful Wilderness State Park for a fun day on a Lake Michigan beach that has a hard-packed sandy beach and is shallow for great wading or swimming...take a picnic for there aren't any restaurants near the beach! Or head further west after your day on the beach and visit Cross Village with its historic Leggs Inn for dinner.